Accra's poolside bar is a great spot for happy hour. Located on Rockley Beach on the south coast of Barbados, Accra Beach Hotel & Spa offers a pool with swim-up bar, game room, kids club and gym. There’s an adults-only pool and full-service spa as well. The air-conditioned rooms feature free Wi-Fi and a balcony with views of the island, pool or sea. 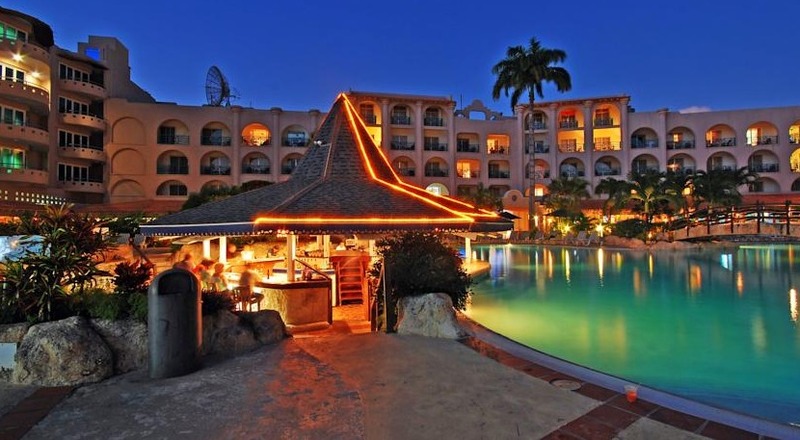 International and Caribbean cuisine is served at the onsite restaurants, and BBQ facilities are available. The Accra Beach also offers karaoke nights, live evening entertainment and cocktail parties. The property is home to the new Pacifika Kitchen, a unique restaurant Pacific Rim cuisine. Fly into Grantley Adams International Airport, Barbados (BGI). Accra Beach is about 20 minutes from the airport. Visit Accra Beach Hotel & Spa’s website for more information.